Catastrophic Floods In Louisiana Have Caused Massive Housing Crisis : The Two-Way An estimated 40,000 houses have been damaged by flooding that some people have compared to the aftermath of Hurricane Katrina. Some 86,000 people have applied for federal disaster aid. Leslie Andermann Gallagher surveys the flood damage to her home in Sorrento, La., on Wednesday. 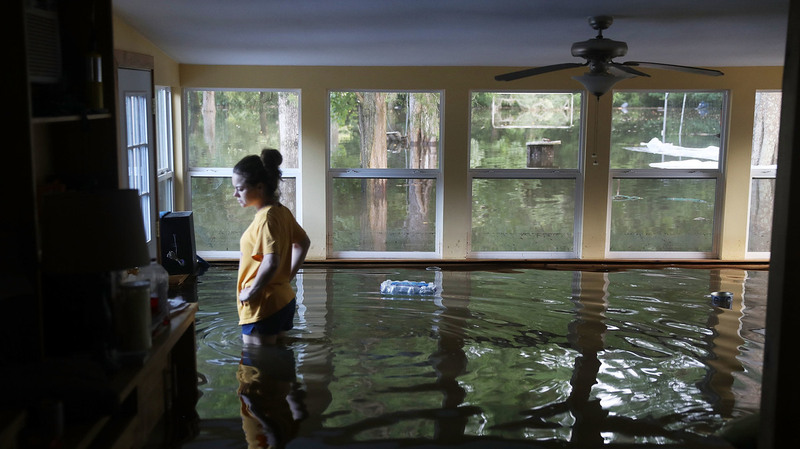 Devastating floods in Louisiana have left an estimated 40,000 houses damaged; some 86,000 people have applied for federal disaster aid in the wake of the disaster. It's a crisis some people are comparing to the aftermath of Hurricane Katrina. The disaster area stretches over 20 parishes, Eileen Fleming of member station WWNO reports, and officials are working to determine how to provide temporary housing to meet the extreme need. One challenge, as FEMA Administrator Craig Fugate told NPR, is that the Federal Emergency Management Agency can't rely on one of its normal strategies for rehousing those pushed out by flooding: rental assistance. There simply aren't habitable homes available for rent. "There's not that much that wasn't damaged in some of these parishes," Fugate says, adding that FEMA is working on helping homeowners clean out and repair their homes as quickly as possible. A "no wake" sign is seen along side a street in a residential neighborhood inundated with floodwaters this week in Sorrento, La. The impact of the flood is ongoing; floodwaters are draining south and still rising in some areas. But as water begins to recede in some regions, Fleming reports, the state is beginning a new push to look for flooding victims. "Gov. John Bel Edwards says initial search and rescue operations were focused on responding to people who reported they were in trouble," she says. Now, Edwards says, it's time to "go back and do a comprehensive search, house by house, whether or not there was a call for assistance, to make sure there isn't someone in that house who was unable to call for assistance." At least 13 people are known to have died in the flooding. Some 30,000 people were rescued — not just by the National Guard and official search and rescue teams, but by neighbors equipped with personal boats. The volunteer rescuers are known as the "Cajun Navy," as Ryan Kailath of WWNO has reported. Now, as southern Louisiana tries to move forward, the challenge of recovering from this flood is daunting, in part, because the disaster caught so many people off guard. While the [National] Weather Service had predicted a high risk of serious flooding, "nobody, I think, was prepared for that much rain in that short of a time," FEMA chief Fugate said. 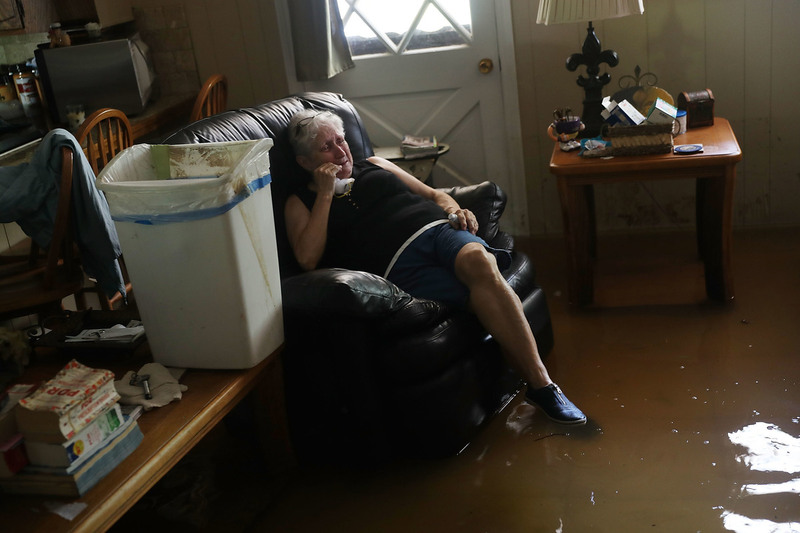 Elsie Lazarus is overcome with emotion Thursday as she sits in her flooded living room while retrieving what she can from her home in St. Amant, La. And as NPR's Debbie Elliott reports, waters rose astonishingly high in places that historically have not experienced flooding. "Even for a state accustomed to natural disasters, this flood is like nothing they've ever seen before," Debbie says. She spoke to Wayne Norwood, who, with his wife, Debbie, owns an antiques museum that was destroyed in the flooding. The couple, both retired police officers, also had four rental homes damaged in the disaster. "We have fire insurance, but we don't have flood insurance because we're not in the flood zone," Wayne Norwood tells Debbie. "And that's what happened to thousands of people." For homeowners in parishes that have been declared disaster areas by the federal government, FEMA will be offering grants of up to $33,000 to help with repairs. Meanwhile, there are questions about whether the U.S. has been paying enough attention to the disaster. 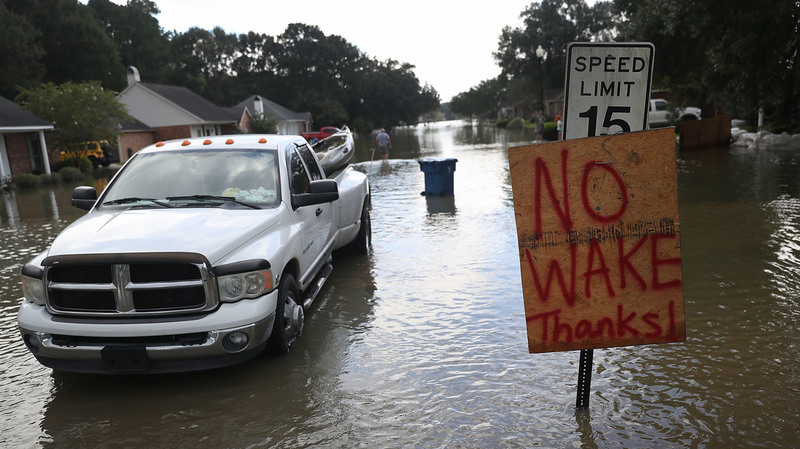 Some people have compared the response to the historic flooding to the often wall-to-wall coverage given to named hurricanes and tropical storms. For several days after the flooding began, President Obama hadn't made a public statement about the flooding or planned a visit. He has now announced plans to visit Baton Rouge on Tuesday, and says he has been updated on the situation by DHS Secretary Jeh Johnson. Press secretary Josh Earnest said in a statement that the president "wants to ensure that his presence does not interfere with ongoing recovery efforts"; the governor had previously said he wasn't upset that the president hadn't announced plans to visit, for precisely that reason. And national media outlets have been criticized for their coverage; The New York Times' public editor wrote a piece several days ago concluding that the newspaper had been slow in paying adequate attention to the crisis.